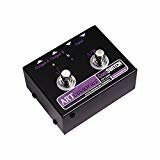 The ART COOLSwitchPro A/B-Y Switch with Isolation is a handy foot-operated box that lets you switch an instrument signal (guitar, bass, or keyboard) to either of two amplifiers or amp channels, A or B. The "Y" function sends the input signal to both the A and B outputs in parallel. Switch-selectable features on the B channel add versatility to the basic switching functions. A high quality audio transformer can be switched in to provide isolation between the input and output signals. This helps reduce the danger of shock when the amplifiers are at a different potential. Also, this isolation, along with a ground lift function, helps to eliminate the hum caused by ground loops. A phase reverse function lets you make sure both amps are in phase. The ART COOLSwitchPro is completely passive with true bypass and is housed in a rugged, stable case with industrial-grade footswitches spaced for easy operation. It will provide many years of reliable service, whether on stage or in the studio.